Swedish artist and entrepreneur Mikael Genberg wants to build a self-constructing home, specifically a trademark Swedish cottage, red with white gables. Complicating matters just a bit, he really hopes to build it on the Moon. The initial idea for "The Moonhouse Project" arose nearly 15 years ago when Genberg learned of the Swedish space industry's plan to build a satellite that would orbit the Moon. Why not, Genberg thought, brighten up the barren lunar landscape with some traditional Swedish architecture? The impossible dream has been in development since 2003, becoming more and more real every day. "The Moonhouse seeks to inspire people to push through our mental boundaries and change the perception of what is possible," explains the project statement. "Everyone in the world has their own personal Moonhouse -- a representation of challenges and goals and how we achieve them." In Genberg's radical vision, a miniature red house will hitch a ride on the back of a spacecraft in October of next year, being self-assembled and transported by US aerospace company Astrobotic. Once in space, the unconventional housing unit will build itself, filling its insides with gas in under 15 minutes. Designed to fit one standing adult, the house measures in at around 8-feet high, 10-feet wide and 6 1/2-feet deep, made from a specially developed space-cloth over a carbon structure. The little guy weights just 22 Earth-pounds, but, because there is no wind on the Moon, it should be able to hold itself up. How much does it cost to ship a small house the approximately 238,900 miles (384,400 km) journey from Earth to Moon? Around $15 million, a price funded in part by partners from the private sector but mostly from an independent crowdfunding campaign. Supporters of the endeavor can pledge "Moon meters" to the cause; every one dollar donated takes the Moonhouse 25 meters closer to its final destination. 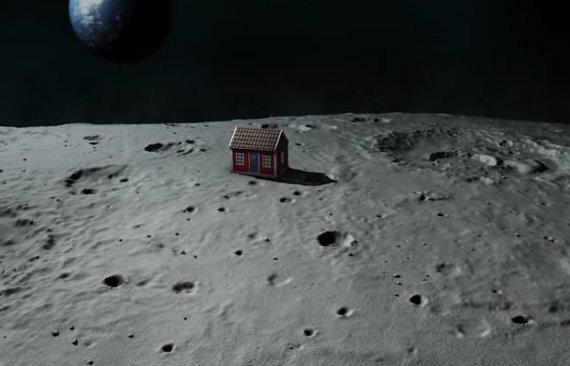 "Putting a house on the Moon should be impossible, but through crowdfunding, through the internet through being enough individuals going together proving this that means that we can do anything," Genberg told The New York Daily News. Thus far $4,372 had been raised at the time of publication, with over 80 days remaining to take part. "Historically, space has belonged to an exclusive few," the project statement explains further. "The Moonhouse is a democratic art project in space where everyone is welcome to participate and help create a unique symbol for what people together can achieve. The Moonhouse allows space to become more accessible to everyone in bringing man closer to the Moon." Genberg's not the first artist to have lunar art ambitions. German-born Agnes Meyer-Brandis has been training a flock of "moon geese" to fly to the Moon in 2027, while a group of artists operating under the name "Republic of Moon" attempted to create an embassy to Earth's great natural satellite. We're just happy Damien Hirst's attempt to blast a spot painting into space didn't pan out. Learn more about The Moonhouse in the video below and let us know your thoughts in the comments. For a different take on art in space, check out photographer Trevor Paglen's mission to launch an art exhibition into the great beyond. CORRECTION: A previous headline incorrectly mentioned that this house would be the first artwork on the moon. As the article points out, this would not be true. We apologize for the error.